When considering ad placement its tempting to immediately think in terms of making our ads very highly visible to the visitor and putting them in ‘hottest’ of spots, so they are hard to miss. 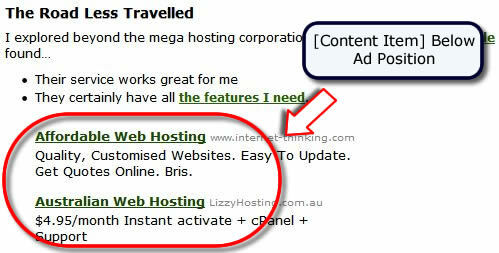 How about if instead you think in terms of adsense ads providing ‘additional useful content’ to your visitors. To demonstrate this I’ve put together a a demo site called my-web-hosting-review.com. 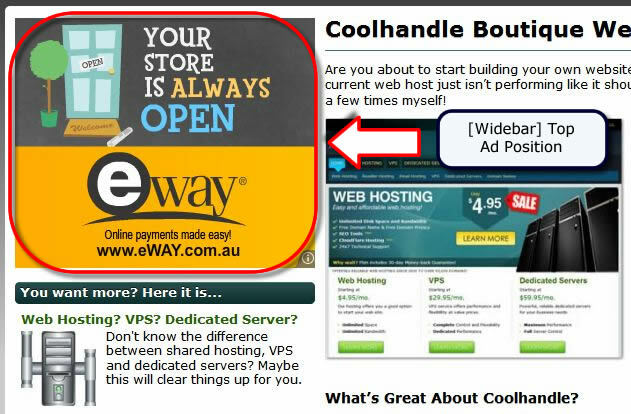 It’s an affiliate site for a boutique web host called Coolhandle (and yes I rather like their service and cpanel having had opportunity to try it while putting together the site). 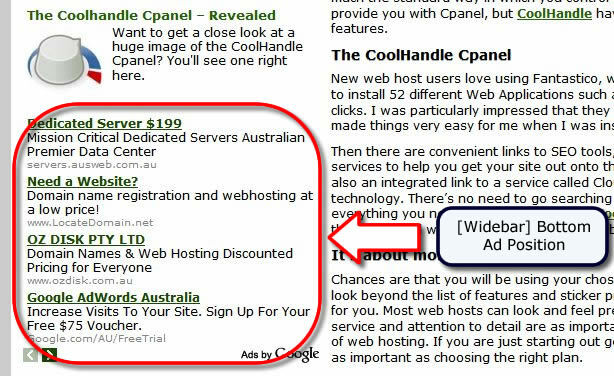 If you look at my-web-hosting-review.com you’ll notice I have blended the adsense ads into the content such that they seem to form natural extensions to the content rather than being placed directly ‘in the face’ of the visitor. 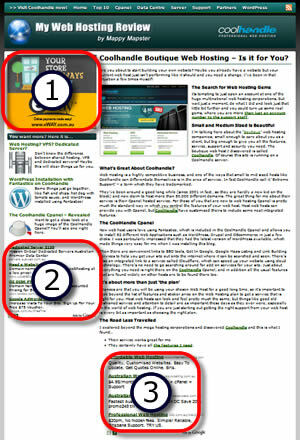 Adsense allows us 3 ad units per page so lets have a look in turn at each one here on the home page of the site. In the top left of the theme sidebar (the [Widebar] Top position in Heatmap-speak) you’ll see I’ve placed a very obvious 300 x 250px Image Ad. The eye seems to fall naturally onto this position, its very noticable, and is potentially ‘very clicky’. Why could this be considered ‘additional content’ when its so up front and noticable? Well, its all down to relevance. Web Hosting is a hotly contested adsense niche with lots of highly relevant image ads available for display. Chances are that adsense will target this spot very well with highly relevant ads which will be of interest to our visitor. This is how adsense is supposed to work – providing useful ads to interested visitors – or in other words ‘additional content’. Another twist is that I’ve made the url in the ad as grey as adsense allows giving the impression that the ads are indeed additional content. Again, the relevance of the ads returned makes them useful rather than annoying. When a visitor reads a page or post, inevitably they come to the end of the post and look for where to go next. I have placed an ad (with colours designed to blend) conveniently at the bottom of the post, and aligned it using the ‘blended list’ technique as described in the first episode of this series. Anyone who is actively looking for a web hosting solution is likely to find something of interest here, so again this acting like additional useful content rather than advertising. If you start to think of your adsense ads as actually useful blocks of information for your visitors then you’ll probably come up with site and content designs that look more refined, seemingly more informative and useful than if you think of content and ads as two seperate things. Give it a try. Come up with your own ad placement combos if you can. Let me know how you go!